Owner and Artist at Liz Ann Lange Art & Design Studios, located in the Lower Level of 604 Erie Ave. in Sheboygan, Wisconsin, USA. 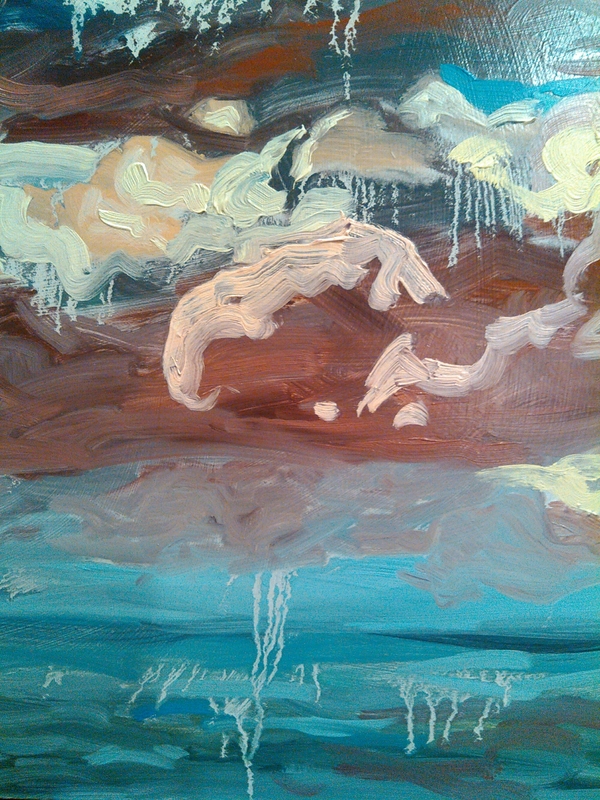 I am applying a layer of alkyd medium over my thin glaze layer on the big canvas. I like the way this particular alkyd medium travels when I use a little too much, or when I don’t wait long enough for it to tack up before I start painting over it. It also gives things a nice shine without being glaringly glossy the way a varnish would be. 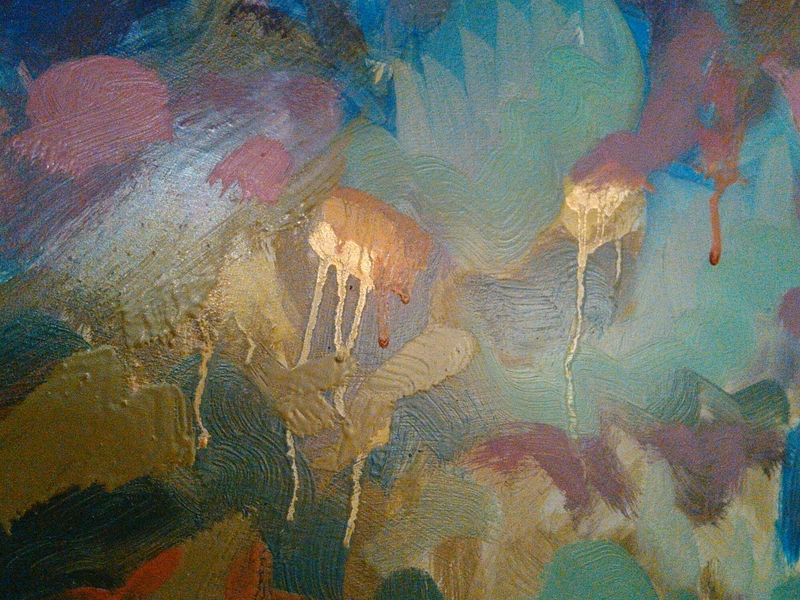 I love the depth it gives to the metallic gold oil paints I use. When applied liberally to paint, or when painted over before its had the chance to cure, this medium sends small drips that slowly meander down the surface of the painting for days after you think it had stopped. Its misuse causes such wonderful effects that I willingly leave to chance, layering intent over subtle chaos. Today at the day job (I’m living the dream by working at an art supply store! 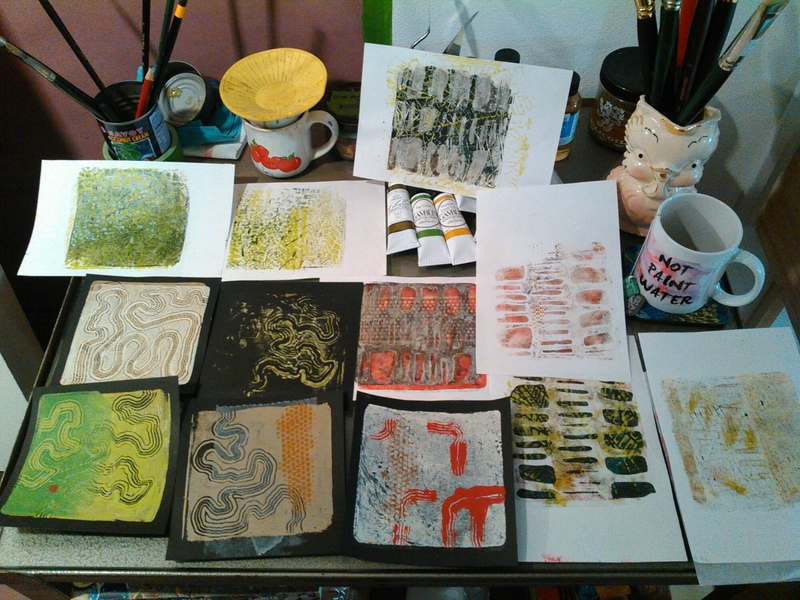 ), I got to attend a super fun mono printing workshop lead by my super fun artist friend, Mel Kolstad! We used 5-inch square Gelli plates and acrylic paints to achieve one of a kind prints, using stencils, objects to make textures, and different wipe out tools for reductive effects. I’m excited to be participating in the 8th Blank Canvas event at the Knaak+Juarez Studio! Many thanks to all of you who made March 5th’s Studio Opening a success! Last week Thursday was my last official day as the Artist in Residence at Sheboygan North High School. I left one studio and moved into another! I am proud to say that this transition is going very well so far. I even had 2 visitors today!